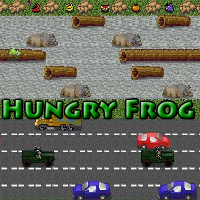 This free HTML5 game is based on the classic Frogger from the 1980s. Although the graphics have been updated and are rather more stylish and less blocky, the basic principal of the game remains the same. Simply use your arrow keys to help the frog cross the busy road, avoiding the traffic and the snake. Then cross the river by jumping on the hippos and logs and try to land in a safe spot where there is fruit. Be warned, though, some hippos dive under the water so you'll need to leap off these before they dive or your hungry froggy will drown! Can you get onto the high score leaderboard?